Title: SPIRITALI DI HERONE ALESSANDRINO Ridotti in lingua Volgare da Alessandro Giorgi da Urbino. Description: Urbino, Bartholomeo e Simone Ragusii fratelli. 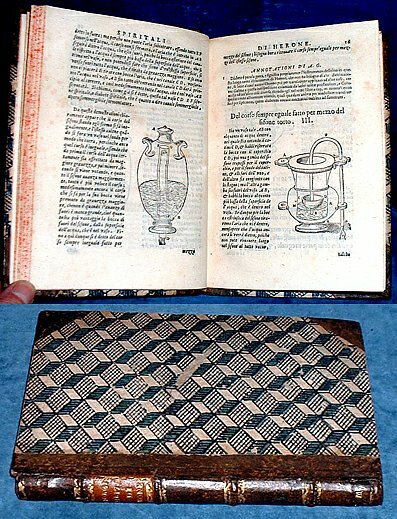 1592 Woodcuts (90 including repeats) of fountains, experiments, automata etc. . Quarto later gilt half calf with continental paper covers (top & bottom compartments of spine bit damaged corners rubbed & one slightly bumped)  + 82 leaves (foliated not paginated so = 164pp) collated complete. All edges red dyed. Bookplate ex libris Iohannis Baptistae Chiavarelli on pastedown, less than 2" oval purple stamp (rubbed out with thinning & lesions to paper) on title, another similar at margin of index, and 2 small stamps crossed out on blank areas of title. Prelim leaves & first 4 numbered leaves very faintly damp marked but paper quality is unaffected. *A crisp clean well illustrated book, with figures of pneumatics and hydraulics featuring many types of water fountains including moveable figurines, ways of moving and raising water and other scientific experiments etc.